Fort Atkinson, Wisconsin. Jones Dairy Farm is a family-owned and operated business. Inspired by his mother's all-natural, homemade sausage recipe, Milo Jones had a vision to share it with his family and friends. 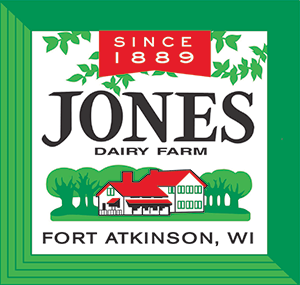 He started Jones Dairy Farm in 1889. Today, more than 125 years later, Jones Dairy Farm is a leader in all-natural breakfast sausage and other popular items, including dry aged bacon, ham, Canadian bacon, turkey and sausage, braunschweiger and scrapple. Still located on the original family farm in Wisconsin, Jones Dairy Farm is committed to the same fundamental principles today as when the company was first founded. The Jones family guarantees farm-fresh goodness in every product they make, a guarantee that comes naturally when you’ve refused to compromise quality for six generations.